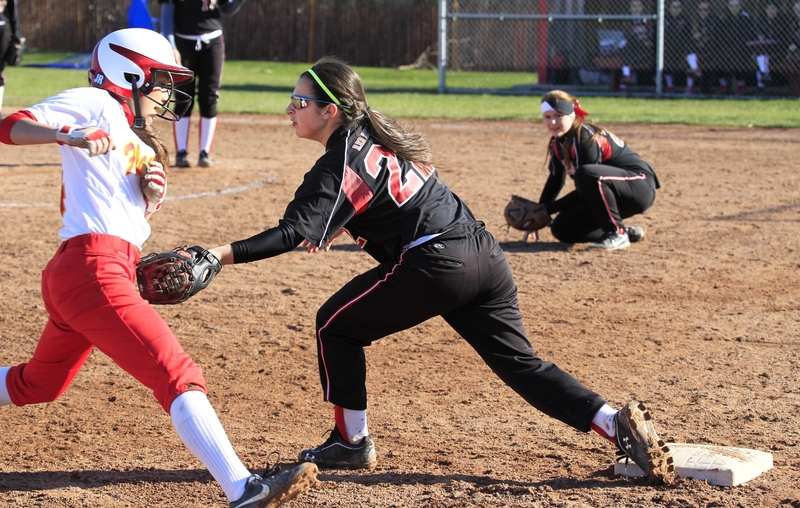 Clarence third baseman Gabby Keller tags Williamsville East’s Marissa Birzon as she attempted to steal third base. Clarence won the game, 16-2. Another year, another solid performance in the circle for Katrina Buczkowski. The senior had 15 strikeouts and allowed just two hits for Clarence as the Red Devils defeated Williamsville East, 16-2. Buczkowski went 20-3 for Clarence last season. Mariah Harris drove in four runs and homered as the Red Devils moved to 2-0. It was a complete day for junior David Lyskawa. Not only did he pick up the win in the relief, he helped his own cause by driving in the winning run as Williamsville North edged Frontier, 2-1, in an ECIC I baseball matchup. Frontier jumped out to a 1-0 lead and Williamsville North tied the game in the fourth. That’s when Lyskawa came into pitch, tossing 3∏ innings of no-hit baseball. He had the game-winning hit in the top of the sixth then had defensive help in the bottom of the seventh. A smash from the leadoff batter was sailing well over the outfield but rightfielder AJ Aqualino made a circus catch to save the hit. Katie O’Donnell scored in overtime to give Sacred Heart an 11-10 win over Mount Mercy in Monsignor Martin girls lacrosse. Remmi Zaepfel scored four goals with three assists as Sacred Heart improved to 3-0. Erica Dombrowski finished with 18 saves. In Class B, West Seneca East improved to 2-1 with a 12-9 win over Williamsville East. Felicia Suto scored four goals with an assist. Laura Skrzypczyk had three goals and an assist while Elena Osmanski collected her four points on two goals and two assists. Orchard Park High School will honor late baseball coach Bob Barrows during a pregame ceremony at 3:30 p.m. May 3 when the Quakers host Canisius in a nonleague contest. Barrows won 643 games as head coach at OP from 1961 to 2000. While he stepped down as head coach in 2000, he stayed on as an assistant coach to current coach Jim Gibson for 13 more seasons. Barrows, who spent most of last spring coaching on the bench instead of from the first-base box while dealing with the effects of liver cancer, died at age 79 last July. The program plans to unveil a banner on the right-center field wall underneath the scoreboard displaying Barrows’ name and jersey number (No. 44). Coach Gibson said Barrows’ family will be in attendance and will be involved in the ceremonial first pitch.